While my recent Japan-themed reading has left a stack of review copies languishing on the shelves, including several fairly thick books, sometimes you’re just in the mood for something a little lighter – which is how I came to pick up today’s choice. It’s another book published by the good people over at Hispabooks, a small press attempting to raise the profile of contemporary Spanish literature in the Anglosphere. This one’s a novella which you can knock off in an hour or so, but the writing is excellent, with a lot more hidden between the lines than first meets the eye. Let me take you off on an island holiday, then – sadly, the weather isn’t much to write home about. Guillermo Stein came to the school in the middle of the year, arriving on a bicycle. None of us came to school by bicycle. The new boy makes quite a stir in the established calm of the schoolyard, his blond hair, blue eyes and fashionable clothes allowing him to stand out from the crowd, and Ridorsa soon becomes close to the newcomer, visiting him and his sister in their house outside the main town. However, Stein (or, more accurately, Stein’s father) has a secret, and it’s one which has a direct bearing on young Pablo’s well-being. Having lived with his grandparents for several years, the only contact he has with his parents are the postcards they send him from various cities around the world. This year, though, he is to discover that there’s a reason for their absence, and the Stein family are closely connected to it. It’s a short work, but certainly an intriguing one. 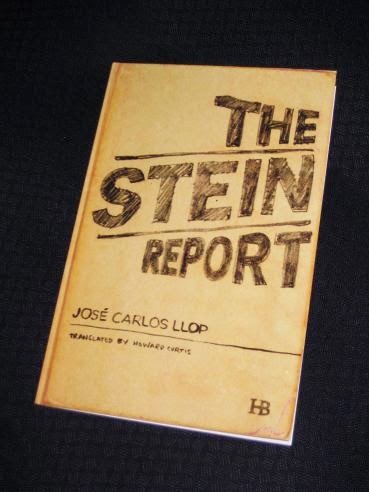 Although ostensibly one boy’s story, The Stein Report is also an insight into WWII events in the region, with the novella touching on the history of Spanish soldiers and Mussolini’s plans for Mallorca. In addition, it’s another of those Bildungsromane set in schools, such as Le Grand Meaulnes or Our Twisted Hero. The first, in particular, has many similarities to this work, with the arrival of a new student, a boy with a difference, and the gradual development of a friendship with the narrator. Pablo is definitely a boy in need of companionship. He spends his life cooped up in his grandparents’ dull, old-fashioned house, and there’s an obvious, yet suppressed, longing for his parents. While he doesn’t make too much of a fuss, there are several scenes (including one weekly ritual involving a long-wave radio) that are simply heartbreaking. Just for these sketches alone, the book warrants reading. However, there’s a lot more to The Stein Report than that. The report itself, commissioned from war expert Planas by class leader Palou, eventually uncovers secrets of Italian spies, black clothes and an Iron Cross as the young boys unexpectedly become involved in some very adult affairs. Ridorsa and his friends love to follow strangers in the street, pretending they’re spies – but what if they’re right? This, then, is Pablo’s choice – to stay comfortable or open the door. He chooses to follow Stein, and his life changes forever. In addition to an excellent story, The Stein Report contains some beautiful writing. The English version comes from yet another well-known translator, Howard Curtis (Hispabooks have picked some of the best for their books! ), and it shows in the wonderful translation. Proustian can be a rather overused adjective at times, but some of the lengthy, evocative descriptions Llop and Curtis create can come close at times, with colours and smells taking both writer and reader back in time. In other places, the language can be simple and elegant, evoking the voice of an innocent adolescent. However, there’s always something more, lurking in the shadows. ← The IFFP Shadow Panel Wants You!